Quality installation is so important to Romac that we consider it one of our three unique qualities in business. 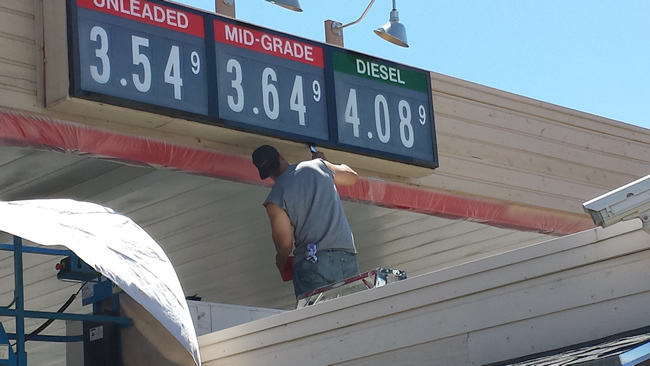 Proper installation is crucial to fulfilling a commercial sign contract but often times it is neglected. Cutting corners or underestimating the demands upon an installation can cost thousands in damages or worse, the loss of life. When it comes to commercial signs both indoors and outdoors, it is hard to tell how well the job was done just by looking. That is until the right circumstances are called upon to challenge the quality of the installation and test the fasteners. Romac uses the most secure and reliable installation materials and methods in order to put our client at rest knowing that the signs so well designed and masterfully made are safe and secure in their installation. Safety is not the only issue to consider in proper installation. Many times theft and vandalism become very costly annoyances. In many universities for instance, well-meaning graduates often take the dorm markers in their hallways as keepsakes of their years of hard work. While this may sound harmless, improper installation combined with poor design will costs thousands of dollars each year in replacement and damages. You can trust Romac to complete the job with the same flair for quality as you will find in our other services.